We all know that if Ireland is to avoid going bust, it has to cut back on state spending very severely. Even with the cutbacks that have already been implemented, state spending is still between a third and a half more than the revenue that's coming in. There is a bigger picture, of course. The huge amount of bank debt we are carrying as a state is too much to bear, and at some point in the future the EU and the International Monetary Fund (IMF) will have to recognize that and accept some level of debt forgiveness. That will reduce our massive annual interest bill and mean that not so much state spending vanishes on that rather than being available for services. But even if that happens, we still face a major readjustment in our spending. And it's essential that it happens as fast as possible if we are to avoid turning into another Greece. To be able to raise state funds on the money markets again and to end our dependency on the EU and the IMF we have to show that we can get our Budget deficit under control again. That means cutting state spending progressively until it comes close to matching revenue. The problem is that it is incredibly difficult to do. Everyone regards their share of state funding to be absolutely essential. We have seen that in the past week, for example, in the bitter arguments that have broken out over spending on small local hospitals. Last weekend Taoiseach (Prime Minister) Enda Kenny was accused of lying because he gave commitments on preserving services at these local hospitals during the election. Now he is faced with the reality of cutting back in health, one of the biggest state spending areas, and some small local hospitals are losing their full accident and emergency services as a result. People in the affected areas are outraged by this because it means they will now be an hour or (in the most remote areas) two hours away from an A&E unit. This is something that people in rural America are used to, of course. It goes with the territory. But here it is seen as completely unacceptable. Irish people want a full 24-hour A&E surgical service on their doorstep no matter where they live, how much it costs or how inefficient it is. We have seen the same kind of emotive reaction in relation to schools recently, when it was announced that the number of special needs assistants would have to be cut back sharply. These are the assistants who help teachers cope with children who have physical disabilities or conditions like attention deficit disorder. It's hard to think of a more emotive issue. But from none a few years ago, we now have hundreds of these posts on the state payroll. And we just can't afford them, just like we can't afford the hundreds of language assistant teachers taken on to cope with immigrant children with no English. There are many other areas where cutbacks have to be made which are equally difficult, for example in relation to psychiatric services or care for the elderly. Cutting back state services here to the level we can now afford was always going to be hard. But it's only now that people are waking up to the reality of just how difficult and painful it is actually going to be. Of course we can increase taxes and that is coming down the tracks, starting with the big one, a property tax, followed by water charges. But the truth is that we are getting into the area of diminishing returns on taxation here. Pushing taxes higher will further depress the business environment and further expand the black economy in which people pay no tax at all. In addition to that, there is a very strong feeling here that people are already paying enough because as well as very high income taxes (when all the extra income levies and charges are included), almost all the services that people access now involve an extra payment. From bin tags for your garbage to college registration fees to private health insurance (because you can't rely on the state health service), people in middle class Ireland pay through the nose for services that are supposed to be supplied by the state. And they do so even though they have already paid for these services through their income taxes. There has been a lot of puzzlement here about why our state services (like health) seem to be in an almost permanent state of crisis these days. It wasn't like this in the old days, people say. After all the years of the boom, why can't we pay now for the services that a civilized society should be able to offer all its citizens? One of the main reasons, although it's rarely included in discussions about our state services, is the change in population. The big increase in our population has put huge pressure on stretched state services. Back in the 1950s (a decade I have been researching recently for another project) the population was 2.6 million. 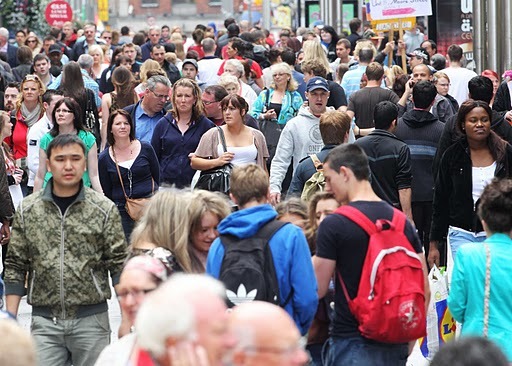 The first figures from the recent census taken in April were published last week and revealed that this year, 2011, our population in the Republic stands at just over 4.58 million, which is the highest it's been for 160 years. This has been a big surprise to all the experts here, who had been confidently predicting that the drastic downturn in our economy over the past two years would have resulted in a sharp fall in our population as immigrants went home and Irish people emigrated. In fact the present population level is 110,000 more than the experts had predicted. That has serious implications for the demand on state services here, in schools, hospitals, public transport and so on. It has thrown the government's forward planning into confusion and will mean that some of the budget estimates for spending are going to be off. And that will mean the EU and the IMF will be pushing us even harder to stick to our deficit targets. The official reaction to the population boom was interesting. We were told that the growth in population had shifted from being fed by immigration to "natural growth." In other words, more babies. Between 2002 and 2006, migration represented 60% of the change in our population, the experts said. Between 2006 and 2011, the change was 65% due to the birth rate and 35% due to migration. What the politically correct official commentary did not make clear, of course, is that the immigrants who came here over the past decade were predominantly younger people, and that a significant part of our baby boom has to do with that. The birth rate in Ireland is currently the highest among all the EU countries. The other factor that is clear is that the expected exodus of tens of thousands of Eastern European immigrants who came here during the boom has not happened. Instead of going home again, they are staying here. Not only that but we are having what the experts call "net immigration" at the moment, and that is likely to continue for the next few years. In other words, in spite of the big numbers of people who are emigrating because of high unemployment here, even more people are still coming here to live. This has caused a good deal of puzzlement in official circles, but there's really no mystery involved. The fact is that welfare benefits of various kinds are much better here than in Eastern Europe, so even if you have lost your job why would you go back to your home country? There's unemployment benefit, rent allowance, children's allowances, fuel vouchers in winter, money for schoolbooks and clothes and so on. All of which add up to a standard of living that even people with jobs in rural Eastern Europe cannot match. The fact is that the children's allowances alone here for three or four kids would keep a small village in rural Romania going. The problem stems from the guiding principle on which the European Union operates. All citizens must be treated equally, wherever they live. So you can't pay immigrants a lower level of unemployment benefit or children's allowances just because in their home countries the cost of living is one fifth what it is here. This has been enforced to a ridiculous degree. For example, immigrants can claim for Irish children's allowances even when their children are still living back in their homeland. It completely distorts the situation and provides a strong incentive for immigrants to stay here even if there is no work. The fact is that this principle cannot work unless all benefits paid by the states across Europe are harmonized, and we're many years away from that. There are moves to change this situation in other European countries, even ones with a very liberal ethos like Holland. The suggestion is that after a certain period out of work, immigrants from other EU countries should be required to return home. This is completely against EU principles, of course. And it's a complicated situation when the immigrants have children born in Ireland. But a solution has to be found. The politically correct attitude is that our expanded younger population is something to celebrate and will be a big benefit to us in the future. But getting to the future without going bust in the meantime is the problem.